In a groundbreaking use of social media - or a massive overshare - UCLA surgeons live-streamed the brain surgery of a Parkinson's disease patient in a series of videos and photos posted on the social media platforms Vine and Instagram. The lucky patient was 39-year-old Brad Carter, who can be seen in the video strumming a tune on his guitar during his brain surgery in order to demonstrate his renewed motor capability. To celebrate their 500th pacemaker brain implant surgery, they announced in a statement on Facebook, Dr. Nader Pouratian's team at the UCLA Health System decided to showcase their surgical techniques for a live online audience. The purpose of a brain pacemaker is to control neural disturbances, like those involved in Parkson's disease. Using a technique called deep brain stimulation, the pacemakers deliver pulses that stop the tremors that can be so debilitating for Parkinson's patients. As many as 10 million Americans suffer from tremors, said the team's statement, and over one million have Parkinson's disease. A spokeswoman told the Los Angeles Times that the purpose of UCLA's first live-tweet surgery was to promote public awareness of brain pacemakers as a treatment for Parkinson's. The UCLA Health System (@UCLAHealth) live-tweeted photos and videos of the brain surgery with the hashtag #UCLAORLive, starting at 6:24 am on Thursday morning, Pacific Standard Time. In the first Vine update, Carter gave a shout-out to his family before the surgery began. In the next, he discussed his song selection. "I'll probably pick a couple of original tunes," said Carter. "One's called 'Drunk Again'." At 7:41am, Carter showed off his handmade guitar. Here's where it starts to get graphic. At 7:46am, the surgeons began to prepare for surgery. If you're squeamish, you may want to scroll down towards the end to avoid the sight of blood. The first step was to prepare Carter's scalp for penetration. Next, he was fitted with a head frame. A CT scanner was used to target the location of the implants in Carter's brain. The surgeons inspected the CT scans. At 9:10am, the brain surgery finally began. In several steps, the surgeons removed the skin and drilled through the skull to expose the location of the implant. 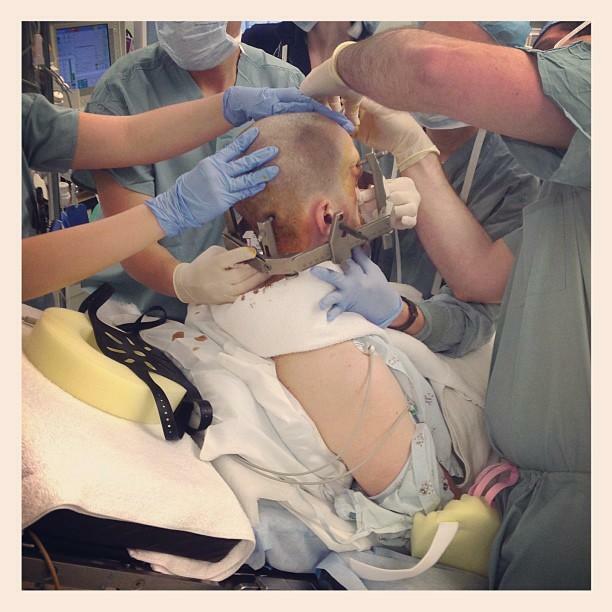 While they prepared the electrode implant, Carter was woken up. Now conscious, Carter waves to viewers, then plays his ditty on the guitar. The surgeons deliver test stimulations to confirm the correct placement of the brain pacemaker. By 10:36am, there seems to be a significant improvement in Carter's tremors. The surgery neared its end, and Carter jammed on the guitar, once again conscious. At 12:45pm, the surgery was complete.